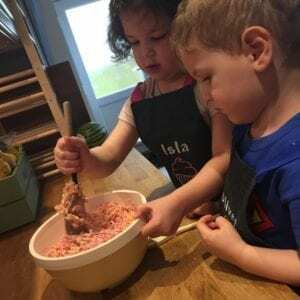 I love baking, and I really enjoying baking with my children. OK so it’s far messier when they are around (I’m not the tidiest baker myself to be honest! ), and it does tend to take twice as long to get anything done, but I genuinely enjoy it. As a bonus I think they do too, beyond the licking of the spoon and enjoying the results! 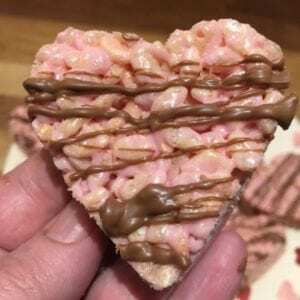 This marshmallow rice crispie heart recipe is a simple take on a classic that the children can get involved in making and eating! 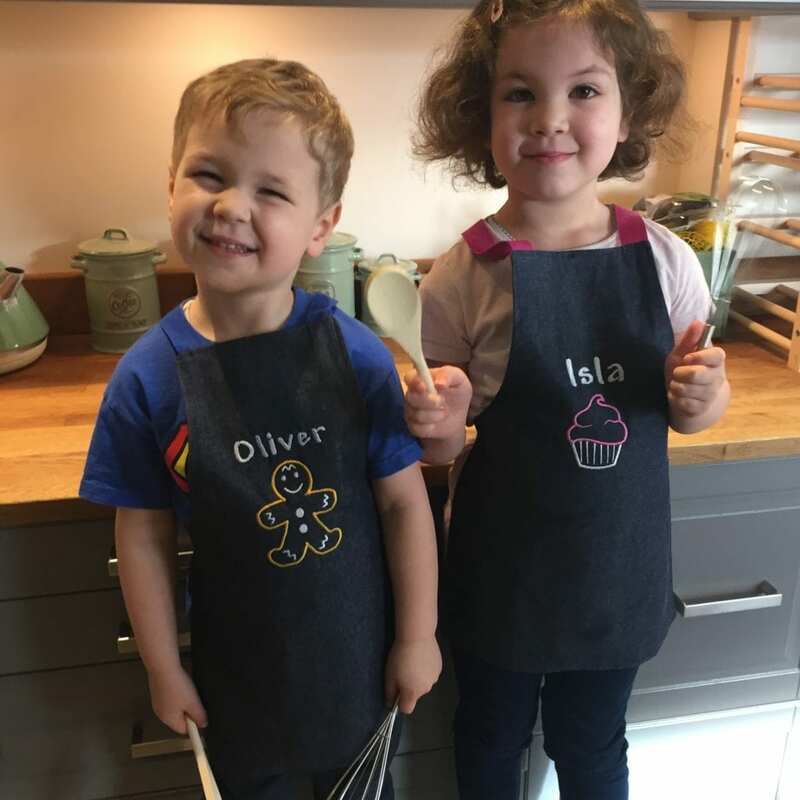 I am no master baker, but personally I feel that baking with your kids is fantastic. I love it. Yes I must be mad, but bar the mess, and the odd argument who has the spoon, who goes first with the measuring etc it is an activity that we can all enjoy. 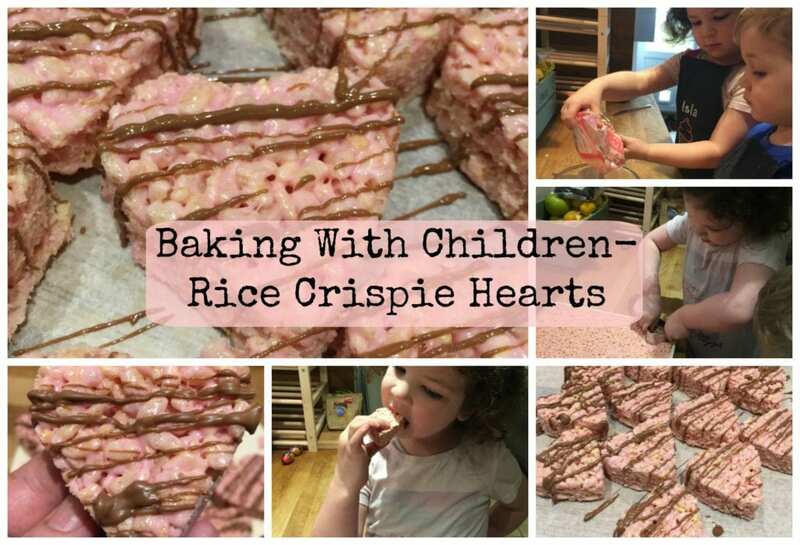 Part of the reason I started my Blissful Domestication blog in the first place was to have an outlet for creative past times such as baking, and it’s great that the kids can be involved too. 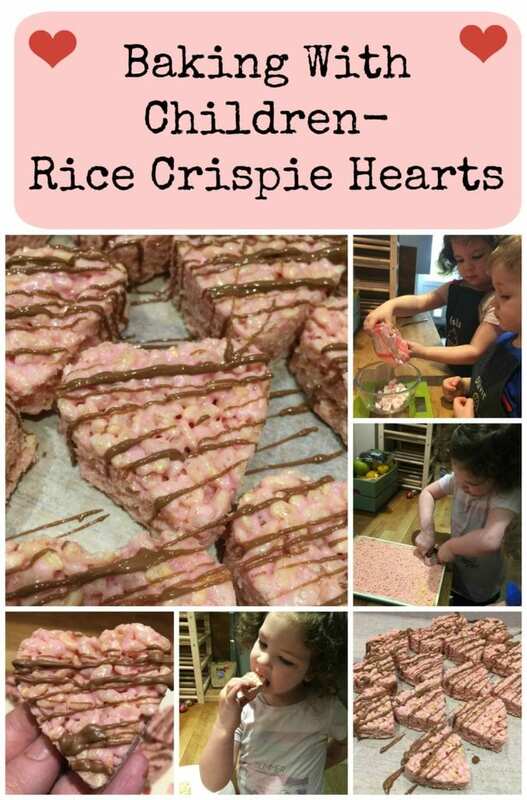 When I saw that Kirsty over at Winettes was doing a guest post series about baking with children, I jumped at the chance to be involved. Isla particularly enjoys helping me in the kitchen. Although it hasn’t got her out of her fussy eating habits, she is starting to understand more about food because of this. 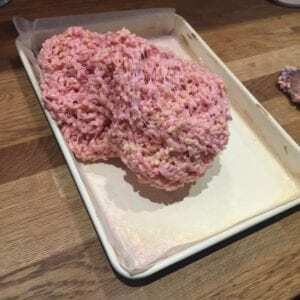 Learning what food looks like before and after it’s cooked, what happens when you mix things together and what you can create with food. 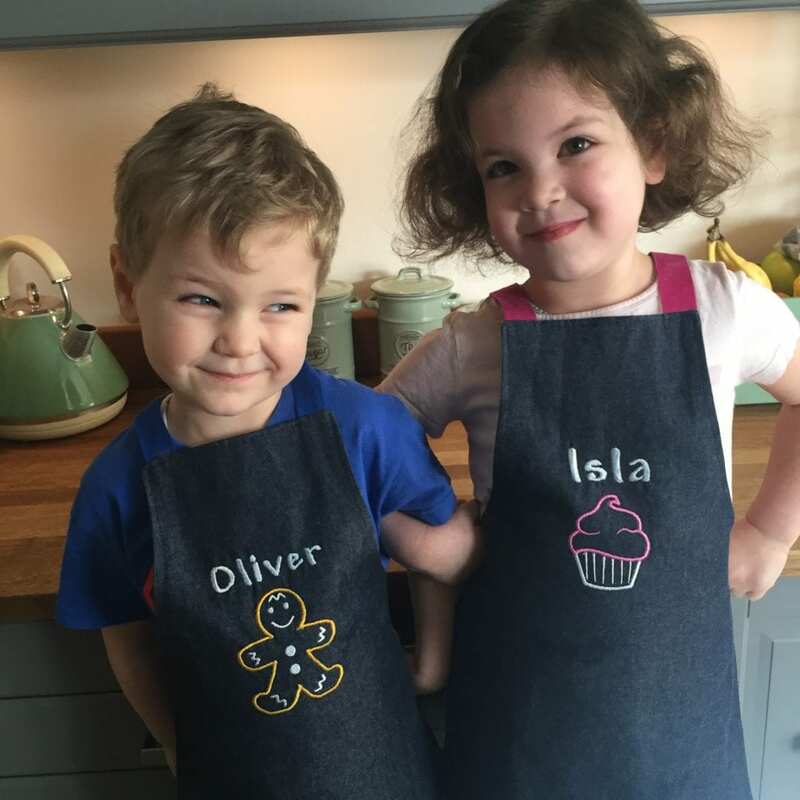 Aprons are essential when baking with kids! 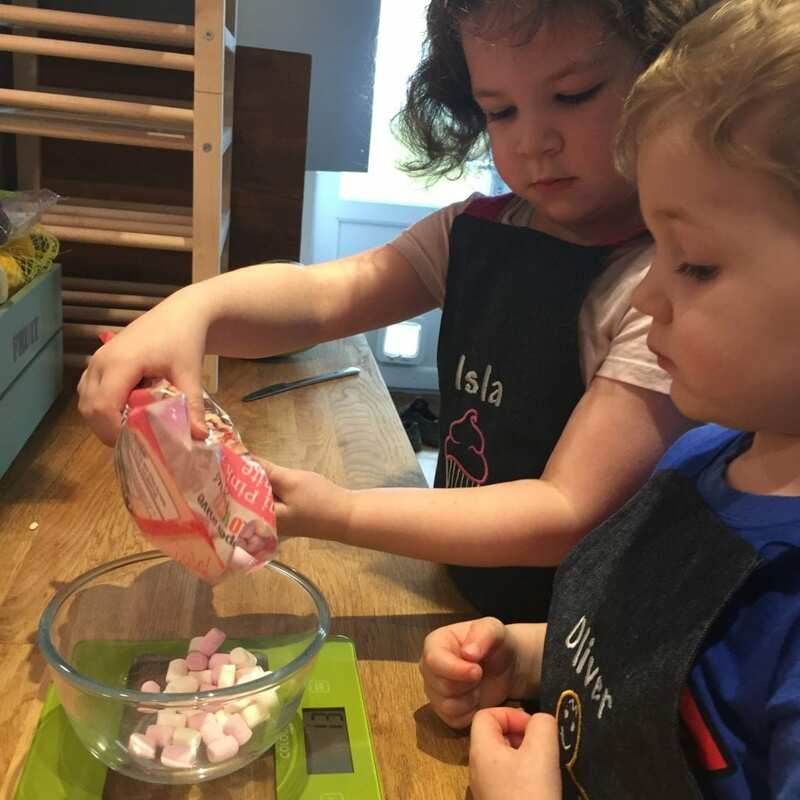 Not only does baking help teach our children what food is, it can also teach them numeracy skills and weighing and measuring. 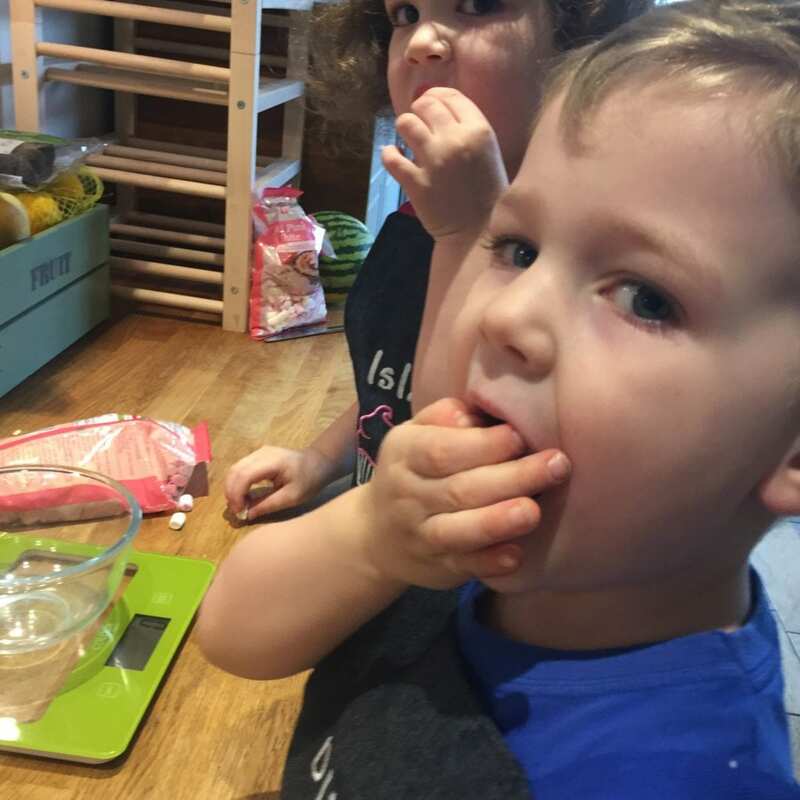 I often get the kids to weigh out the ingredients for me (supervised obviously!) and put them into separate bowls before we even start. It helps with their understanding of weights and measures. In particular the difference between weighing and measuring liquids versus solids, and numbers. My son is only 3 1/2, yet he was telling his sister when the scales read 100. Can’t be a bad thing, can it? More marshmallows seem to be being eaten than weighed out! So on to the recipe, a simple take on a classic. 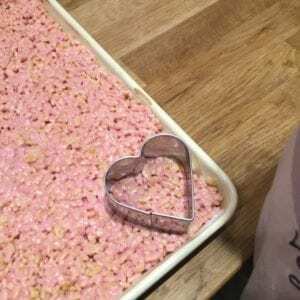 Part of the reason these turned into rice crispie hearts is the fact I couldn’t fine any plain white marshmallows, only the pink and white ones. So knowing they would turn out pink, I thought they might look more appealing as hearts rather than squares. Weigh out the dry ingredients. As explained before I get my kids to do this. However, they did get a bit distracted eating, rather than weighing the marshmallows! 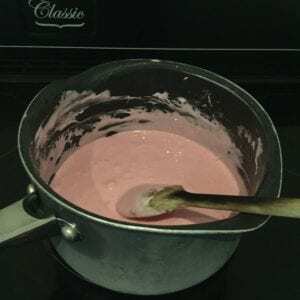 Melt the butter in a saucepan on a low heat. Obviously this is an adult task. It’s important to have it on a really low heat so not to burn it, and stir frequently. When the butter has melted, add the marshmallows. Keep on a low heat, stirring continuously. You do not want to burn it at this point. 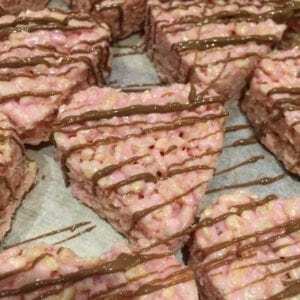 The marshmallow doesn’t go to a really liquid form, juts into a gooey mess! When all the marshmallows have melted, add the vanilla extract and stir well. Now it’s time to add to the rice crispies. 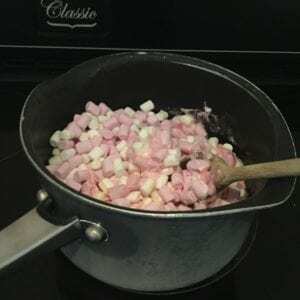 You can add the rice crispies to the saucepan, which makes mixing easier as it keeps the marshmallow mix warm. 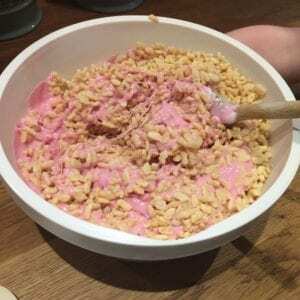 Or you can add the marshmallow mix to the rice crispies. I choose to do the latter so the kids could join in with the mixing. However, this mixture can be hard to stir, and it gets sticky really quickly. I have found the best way is to do the initial mixing yourself which can help prevent spills (use a bigger bowl than I did! ), then let the kids have a go. Once all mixed, tip into a tray greased and lined with grease proof paper. Now is the fun part. The easiest way to spread the mixture out in the baking tray is with your hands. Now the mixture is really sticky and this can be really messy! But if you grease your hands first with a little butter, it’s child’s play! 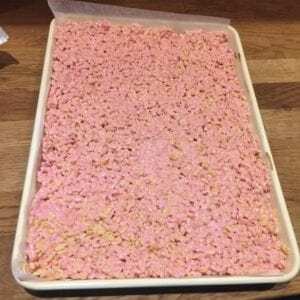 Once the rice crispie mixture is fairly evenly pressed down into the tray, pop in the fridge. When set, we used a metal cookie cutter to cut into hearts. It was actually quite difficult, so I ended up taking over from the kids. I then planned to drizzle them in chocolate. I did intend to let the kids do this, however they were too busy munching on the hearts to want to do anymore, and settled down to watch power rangers. So this was a task I did myself. All Done! Enjoy eating them! 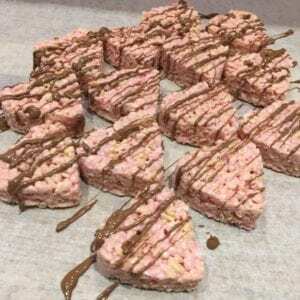 Place the hearts on greaseproof paper…. ….before drizzling them with melted chocolate. Enjoy! She couldn’t even wait for the chocolate to go on them! What do you think? Is this something that you would give a go with your children? 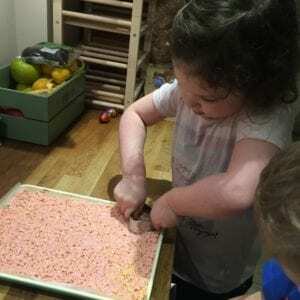 You can check out the rest of the fab Baking with Children guest post series over at Winnettes. 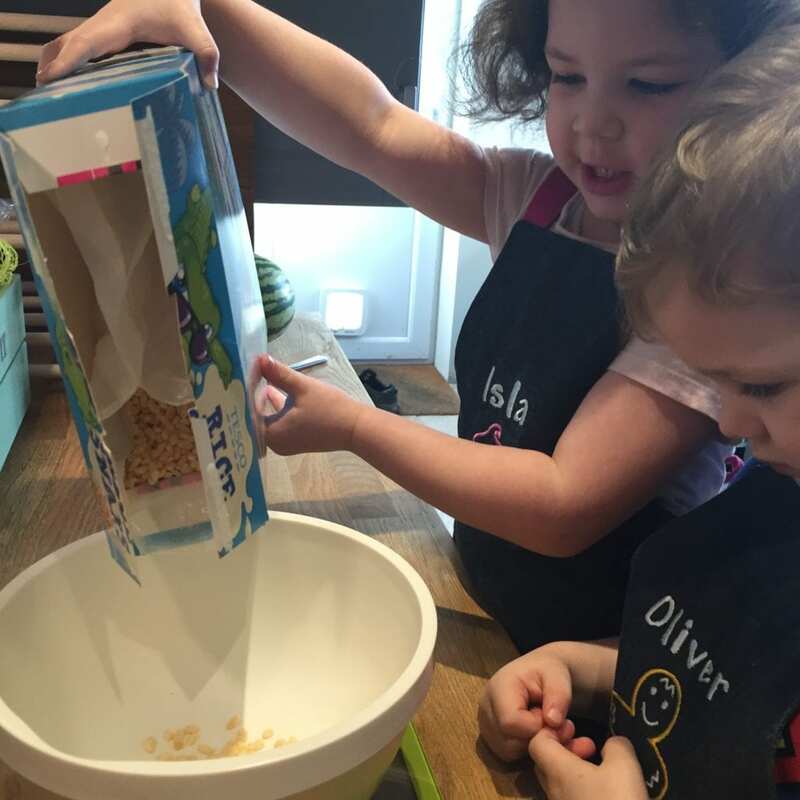 I love cooking with the kids, despite the mess! I know, so gutted they didn’t have adult sizes! Yes you can’t beat getting sticky hands when baking! This is a really clever idea- love it, I’m going to try it.